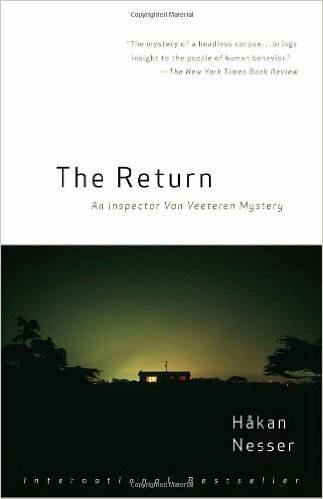 The Return by Håkan Nesser is the third installment in the Inspector Van Veeteren series. It is preceded by Borkman’s Point. On a rainy Spring day, a group of young children are on an outing, when a young girl discovers a body wrapped in a blanket. The police arrive and discover the head, hands and feet have been removed. First the body must be identified, then the case must be solved. Chief Inspector Van Veeteren is about to take a medical leave to undergo abdominal surgery for cancer. The identification of the body poses some problems, but when it is complete, it is discovered that the victim is a twice convicted murderer who disappeared on the very day he was released from serving a 12 year sentence in prison for the murder of his fiancée. The Return is both a tightly strung psychological thriller and a well-plotted and timed police procedural. Unlike the first two books in the series, The Return hooks the reader from the start with a “perfect crime” scenario that draws out the gritty, fascinating qualities in the characters. On each page, the reader is drawn in to the investigation and the personal and interpersonal struggles of the characters as they try to balance their work and personal lives in the face of the investigation. Håkan Nesser shows his talent for fluid, engaging narrative. Laurie Thompson renders the writing into a most enjoyable stylized English that snaps at times like classic noir, but still retains the charm and modernity of the Swedish. If you enjoy the ambience and psychological presence of police prodedurals like Arnaldur Indriðason’s Inspector Erlendur series or Henning Mankell’s Wallander series, you will enjoy The Return by Håkan Nesser.